A license to practice pharmacy is required in all 50 states, following completion of a doctoral program in pharmacy. There are several degree options in pharmacy. The Pharm.D. is the degree most individuals pursue in order to dispense medications. However, you may wish to obtain a Ph.D. in Pharmaceutical Sciences; this degree allows you to be more involved in the research aspect of pharmaceutical development and not directly with the administration of drugs. Admission to pharmacy schools is highly competitive; you should have at least a 3.3 grade point average, have spent considerable time shadowing a pharmacist, have significant volunteer hours, letters of reference, and satisfactory to excellent scores on the PCAT admission test. Most pharmacy schools require that you complete two semesters in each of the following: biology; anatomy and physiology; microbiology; general chemistry; organic chemistry; physics; English; mathematics (typically calculus and statistics); plus one semester of public speaking and economics. Pre-pharmacy students of all majors are eligible to participate in this pre-professional program. Summer Scholar studies molecules that are foundation for new pharmaceutical drugs. 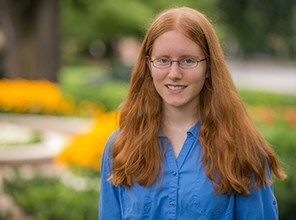 As a Summer Scholar her senior year, Rose M. Kohinke '14, worked with Dr. Skip Brenzovich on "Palladium-Catalyzed Synthesis of New Chemical Reactions." An important area of organic synthetic research is the production of molecules that can be used as the starting materials for pharmaceutical drugs. The goal of her project was to investigate the reactivity of palladium metal, specifically exploring new chemical reactions that can help build these molecules in a faster and cleaner manner, in the hopes of decreasing the prices of important medicines. Kohinke joined Dr. Brenzovich's research team during her junior year. She was a biochemistry major at Roanoke, graduating in 2014. Kohinke is now attending the Virginia Commonwealth University School of Pharmacy. She will receive her doctorate in 2018. We've established relationships with internship and placement sponsors in a wide range of medical specialties, from anesthesiology to pharmaceutical companies. Our grads go on to top-level graduate programs.